This salad is simple but big on texture. 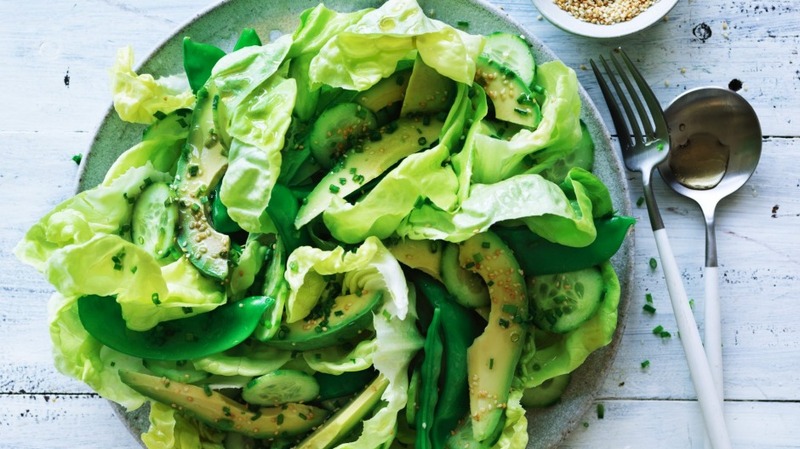 Crisp lettuce, crunchy snowpeas, silky cucumber and creamy avocado are a fantastic combination, perfectly complemented by the light sesame dressing. 1. Bring a small saucepan of water to a boil and blanch the snowpeas for just 45 seconds, refreshing them in cold water. Peel the cucumber and slice into very thin rounds, preferably using a mandoline. 2. For the dressing, whisk all the ingredients together in a small bowl. Combine all the green ingredients in a large bowl, pour the dressing over the top and gently toss with your hands to coat them. Transfer to a serving dish. Serve with Adam Liaw's black pepper teriyaki chicken wings.